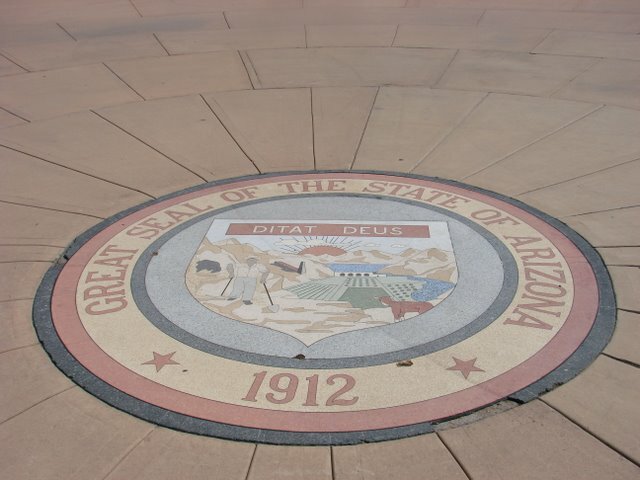 This Motto on the State Seal is commonly referred to as God Enriches but it has much stronger meanings. Perhaps in today's world we do not recognize the depth of feeling when we refer to God in a public fashion. Arizona is more of a temptation until you yield to it and move here. Who knows for sure? It could be inspiration. We'll take either motivation if it gets you out of that stall. There is a story from documents found in 1910, researched by Guy Chadwick, that the early folks thought that the translation meant "God Reigns" (which if used in the right context could be true.) This was considered a humorous play on words which could mean "God rains" and of course, we Arizonans love rain or any natural precipitation, for that matter. When it rains, its going to be a great day! The deserts smile and the mountain streams flow. The slogan started as early as 1863 when Honest Abe made us a full fledged territory. 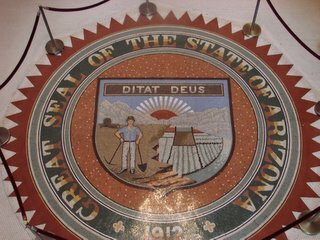 It would be nice to find the story of who came up with this Latin translation for our Arizona state seal. In Arizona God has done all of these things and He is all of these things. Its all part of the freedom experience here. It is hard to ignore a higher power out here. Attend one of our lightning storms in the desert or watch a few sunsets and well, it'll at least lift you up. If you don't believe in God, (No matter, He believes you.) the freedom experience in Arizona is thus considered a phenomenon. The Motto is in code. Da Vinci has nothing on us.